I hope your day is shaping up to be a great one! I have a great Mother’s day project to share with you. But first if you are following along with the reading in Psalms, here is today’s passage. May this passage bring healing, hope and blessing to you. So here is what I came up with for today. These little pop up card boxes are all the rage right now. Funny how something can become such an “in thing” isn’t it? I shared the first one I created HERE and you can still get the free file for it if you use machines compatible with cut files. But for those who may not have that option, the only other option is to cut and score a template by hand. Well, I happened to be looking through my Cricut Artiste handbook and I noticed this box. It had flaps that hung open much like the card boxes. So I decided to experiment with it and this is what I came up with. I simply used the box on page 54. I used the fit to page function and cut it out in pink cardstock. I used some Prima flowers I had in my stash. I used two stamps from Close To My Heart. The heart shape (can’t really see it from this angle) and the Happy Mother’s Day stamp. I used a Martha Stewart Butterfly punch and a grass punch. I used an XL Daisy punch for the leaves behind the flowers. I did ink the edges of the butterfly with some Barn Red Ink. This stamp collection is compatible with the Artiste Cartridge. This stamp collection is compatible with the Art Philosophy Cartridge. To make it a “pop up-able” box, I cut off the bottom of the box and assembled the four sides only. By not adhering the walls of the box to the base, It gave it the ability to become “collapsible”. This is a view of the pattern when cut from your cricut. Just cut the bottom piece off. To make the cut line up, you can fold the pattern in half and follow the bottom edge of the panel that folds onto the one you are cutting. To make the inserts you will need to “fudge it” a bit. The box is on an angle. So I cut my strips at 1” x 4” and then score .75” in from each end. Adhere your strip to the inside and then close your box both ways. This will allow your strips to take on the curve of the angle. One side will have a stronger curve than the other. Cut your strips out in the same color as your box to help hide your mechanics. I cut them in white for photo purposes. This is what the box will look like when closed. Obviously the more you decorate outside the box, the more will “spill out” I intended for mine to be full, but you can leave your die cuts straighter. When closed, my card fit into an envelope intended for a 5x6.5 card. These are envelopes from a package of envelopes and cards you can pick up from Michael’s. Here is one last look at the box. I added some pretty pearls from the Paper Studio and a bow from some ribbon I had in my stash. It isn’t exactly like the pop up boxes you see around the net, but it will do the job nicely. 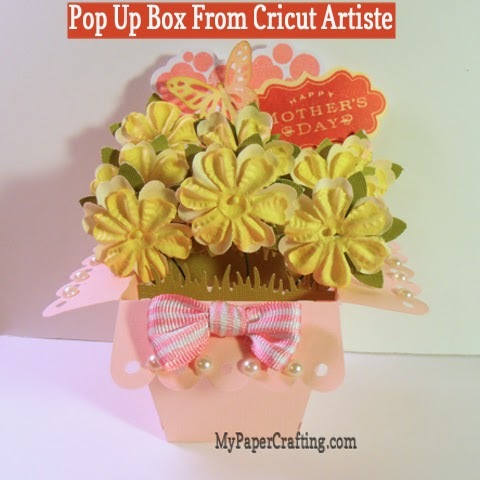 Again, if you need a cut file for a pop up box, visit my other post HERE for the link. What a great idea to use an existing Cricut cut. Your box card is lovely. I always appreciate your directions. Now to take a really good look at my cartridges. This is so cute! You are the most creative person, I love what you can do with things as the aren't "meant to be". You always make them better. Thanks for the inspiration. Thanks Melin, I've been looking for an easy way to make one of these!!! Think of you often. Wow! i have been wanting to make one of these and just couldn't seem to get started. This looks so simple and will be a big help. Thanks! You should enter these at FCCB-they're giving away a $50 SVGcuts.com prize! They are allowing backlinking and 3 entries-you'd have 3 chances to win!